A realistic simulation game, in which the players are driving realistically recreated motorcycles. The game features several hundred licensed vehicles. It can be played alone or with other players. RIDE 3 is a motorcycle-racing simulator. The game is a new entry in the popular series established in 2015. It was developed by Milestone – the creators of previous entries in the series and other franchises like Superbike and MotoGP. RIDE 3 is a racing game in which the players are controlling a motorcycle. The action can be observed from different camera perspectives. The game features a few hundred motorcycles. The developers managed to acquire licenses from producers and thanks to that the vehicles are recreated with details – both when it comes to their looks and technical statistics, as well as behavior on the track. The motorcycles can be modified through an advanced system that features half a thousand different parts. We can drive on a few dozen different tracks. The game focuses on realism – the motorcycles are fast, but it is hard to control them. Different driving conditions can make it even harder. Compared to the first and the second entry in the series, collision and physics systems were greatly improved and they make the behavior of vehicles even more realistic. Luckily, the game also features various types of facilitation for less experienced players. 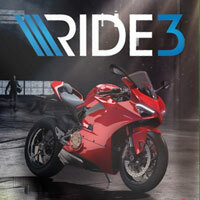 RIDE 3 features singleplayer and multiplayer modes. Among the former, the most important one is World Tour in which the players can compete with drivers controlled by artificial intelligence in various corners of the world. Single players can also participate in time trials and parallel races. The results shape the reputation of the virtual avatar of the player and they impact his or her career. Multiplayer mode features single races and championships. RIDE 3 features three-dimensional graphics that meet modern standards. The game looks noticeably better than the previous entry in the series. Motorcycles models and tracks are looking realistically and they can be liked.